I was just reading an article that talks about how to get your clients’ wedding published either on a wedding blog or in a magazine. And it got me thinking. In the beginning of my career, I worked really, really, really hard to try and get weddings published. But, after a few years, I kinda stopped worrying about it. Mainly because it never seemed to be something of major interest to my clients. But also, since having your work published in a magazine is phenomenal marketing for a wedding photographer, it became something I focused on while I was shooting a wedding. I didn’t like that. I want to focus on my couple. I want to focus on the feelings … the moments. So, I stopped worrying about it. That’s not to say it’s not wonderful to have your work featured! And I love when it happens! But, typically, bridal publications look for something very, very specific. They want lots and lots and lots of detail shots. They want them styled and set up to look very magazine worthy. And in a post that features a wedding, you might see a handful of photos of the couple, their joy, their happiness … and looooooots of photos of details. There’s nothing wrong with this, of course. The entire point of a blog or publication featuring a wedding is to help other brides get ideas for their own weddings. So sharing the details and the info on how the couple put everything together is very helpful for readers. But when I was focusing on photographing tons and tons of vertical images (magazines love vertical images! ), I wasn’t as focused on telling my clients’ stories on their wedding days. I mean, if I have the choice between shooting 50 styled detail images or 50 meaningful images of guests, details, and LOVE … I’m going to choose the latter every time. The details are part of their story. And the details matter. But I want to shoot them in a way that is appropriate for the wedding, my clients’ style, the feel of their day, and as a part of their story. Not because I have a goal for the photos to be published. I went through some old client galleries and pulled out a few of my favorite details shots. I often don’t have invitation shots … not because I don’t ask brides to bring along their invites. But because I’ve worked with a lot of clients over the years that tell me to not even worry about those shots … they don’t want them. I’d say maybe half of my clients say that. I suppose that’s not surprising : ) The brides drawn to me are often drawn to me because they know my passion lies in shooting the real moments … in shooting the love. When I look at these photos, I can remember the venues. I can remember the couple. I can remember the smells and sounds that were there that day. I guess that’s the power of photos. Vertical or not … I try to bake in the actual feel of the wedding in these detail shots. Brooke and Kenny’s backyard wedding in the Hudson Valley. It was all about simple joys, beautiful nature, and happiness. And there was just no way I could shoot this vertically. Not sure why. But I just couldn’t. Brittany and Ray had an AMAZING fairytale wedding at Winterthur in Delaware. I could have hung her INSANELY gorgeous gown somewhere regal. Somewhere that would have shown it off in all it’s glory (I mean … look at that gown!). 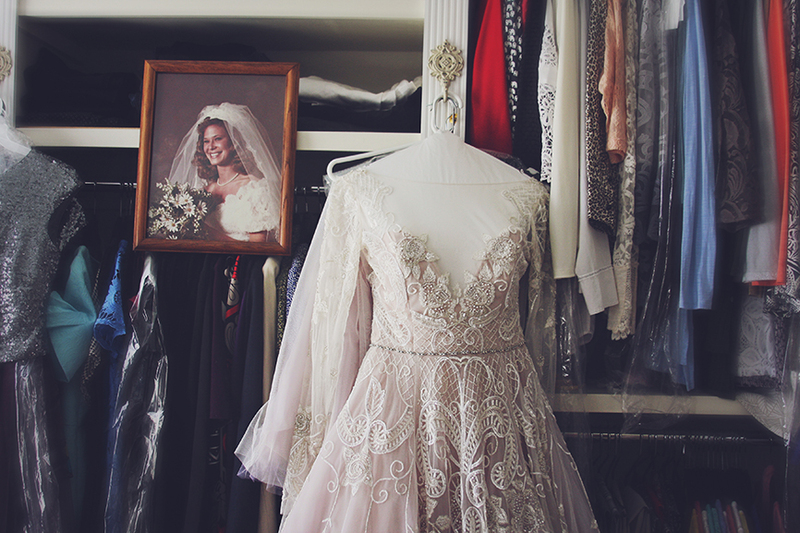 But right next to a photo of her Mom on here wedding day (in her Mom’s closet) just felt right. That’s not really what a magazine is looking for … they want lots of detail shots of the dress without other visual distractions. But I felt in my heart like this might be what Brittany and her Mom would love. Kari and Adam got married at the University and Whist Club in Wilmington, DE. One of the very first things Kari told me was that she was wearing her Grandmother’s watch. We were a little short on time so I didn’t actually have too much time for detail shots. But I knew … KNEW … I had to get a shot of the watch in a very special way. Casey and Giacomo’s wedding at Winterthur in Wilmington, DE was elegant and timeless. 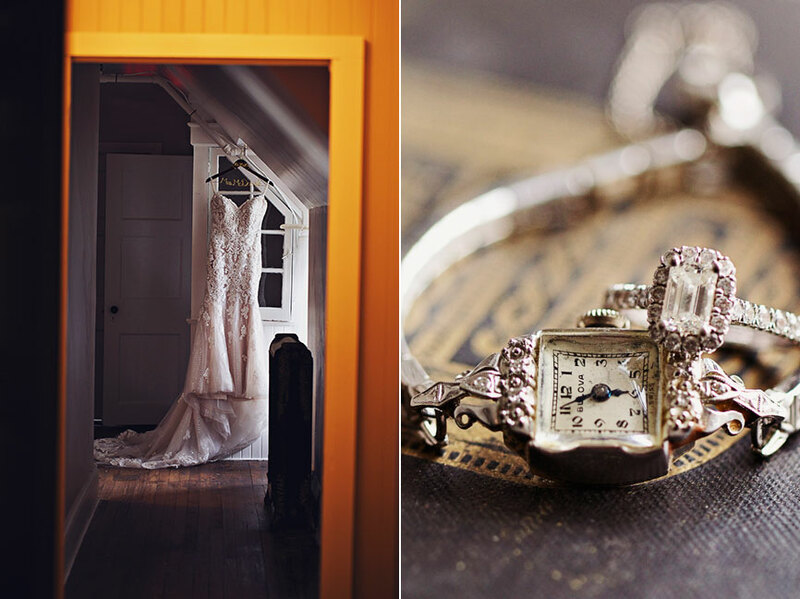 Every aspect of the day had a simple beauty about it … just like the bride. The day itself never felt rushed or hectic. There was a calmness and sweetness. And that’s what I see reflected in this detail shot. Christy and Mike’s wedding at Red Maple Vineyard in the Hudson Valley was just awesome. The venue felt like a PERFECT fit for these two who told me right from the start they didn’t want anything pretentious. They just wanted to celebrate their love … and have AMAZING food. And let me tell you, they absolutely chose the right spot. Their ceremony was gorgeous … and dear Lord, the FOOOOD! So amazing. But back to the rings, lol. 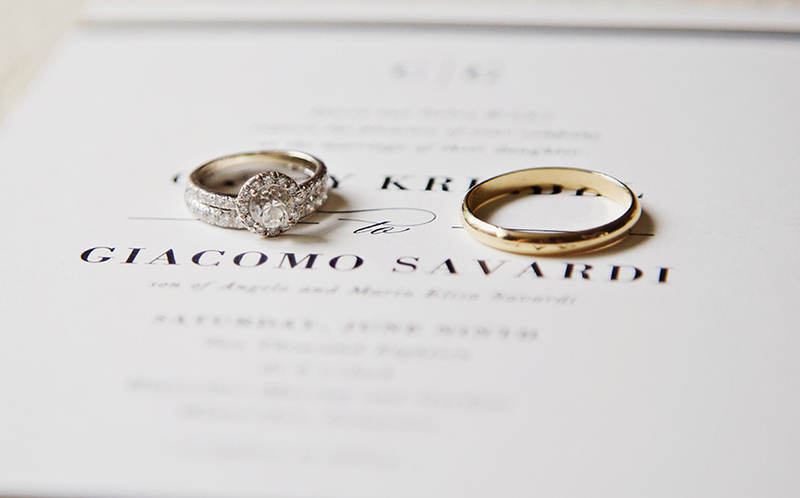 I didn’t want to shoot their rings in a traditional way … I wanted something fun and quirky … like them. Kristen and Dave’s Vermont wedding at Mountain Top Inn and Resort was special for me : ) I’ve gotten to photograph the weddings of all three of the sisters in this family, including the flower girl’s parents. All I could feel all day long at this wedding was familial bond and love … and fun. FUUUUUUN. Kristen and Dave are fun … and there’s nothing pretentious about them. 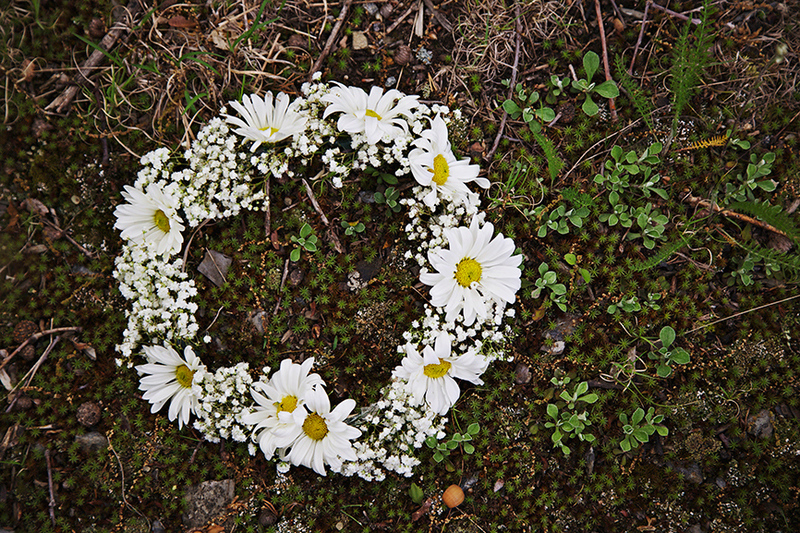 So what better way to marry family, Vermont, and simplistic elegance than with this sweet little photo. Gina and Pat got married at the University and Whist Club in Wilmington, DE. It was a rainy, rainy, rainy day. So we just celebrated the rain. We did their portraits outside with an umbrella. And there was only one way I could capture their rings. Abby and Mark had a lovely wedding at the Brantwyn Estate in Wilmington, DE. The day screamed out sophistication with a twist of retro Hollywood glamour. Nicole and Brian’s Greystone Hall wedding was stylish and elegant. Every detail was lovely and deserving of it’s own photo. Jen and Dave’s wedding at Hollow Brook Golf Course was beautiful. I LOVE walking into a parent’s house on his or her child’s wedding day and finding the house in complete chaos. But not in a bad way. It’s just people pouring out of every door … champagne bottles popping … florists arriving … bridesmaids dresses not zipping up quite right … just regular old wedding day stuff all happening inside a home that has so much meaning for everyone. It felt important to honor the home along with the dress. Claudia and Mike had an amazing wedding at Bartram’s Gardens in Philadelphia. It was colorful. So, so colorful. Yet, simple and elegant at the very same time. Nature was the greatest detail that day. Pam and Justin got married at the Carriage House at Rockwood in Wilmington, DE … and it was a glorious summer day. Everything was so green and lush. Butterflies were literally landing on flower girls. I kid you not. It was just so … SUMMER. So, it only felt appropriate for my second shooter to nab this shot. Wendy and Robert’s Kennett Square wedding day was rainy and full of fun moments and special people. I wanted the detail shots to show both of those things. Greg and Lynn had an amazing winter wedding at the Downtown Club in Philadelphia. It was elegant. It was so classy. And it took place the day of a blizzard!!!!! Like … streets shut down, state-of-emergency BLIZZARD. So, of course, there was only one way I could photograph the rings. Brittany and Tim had the most GORGEOUS wedding at Terrain in Glen Mills.Everything was floral and blooming and just alive with loveliness (as Terrain usually is!). I was in photographer heaven that day!